Rocket launches are spectacular whichever way you look at them. In fact, they’re so darn impressive they can even cause drivers to take their eyes off the road, occasionally leading to all kinds of unwanted metallic entanglements. While footage of most launches is shot by cameras on the ground, we occasionally get a glimpse of a lift-off from another angle, for example, via a camera attached to the rocket itself. But how about this for something a little different: A rocket launch captured by a camera on an orbiting satellite. 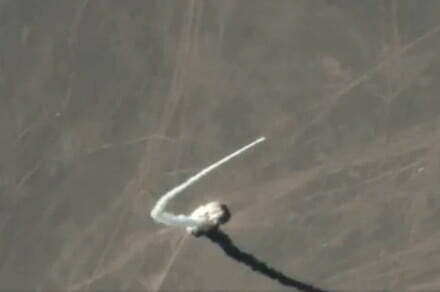 Spotted by The Verge, the camera on China’s perfectly positioned Jilin-1 satellite captured a rocket launch that took place last week at the Jiuquan Satellite Launch Center in the Gobi Desert, around 1,000 miles west of Beijing. The Jilin-1 satellite was orbiting at an altitude of around 332 miles (535 km) as the OS-X1 rocket launched from Jiuquan at around lunchtime local time on Friday, September 7, news site GB Times reported. The video shows the early stages of the launch of the solid-fueled rocket, which took just over three minutes to reach an altitude of 22 miles (35 km). The suborbital OS-X1, also known as the Chongqing Liangjiang Star, is operated by OneSpace, a private space company based in Beijing. OneSpace and Jilin-1 owner Chang Guang Satellite were both founded after the Chinese government began to allow private investment in space companies in 2014. OneSpace has plans to become a major player in the increasingly competitive market of small-satellite launchers, with CEO Shu Chang aiming for 10 launches next year. How do they capture those incredible pictures? YouTube is choc full of stunning rocket-launch footage, shot mainly by cameras down on the ground rather than from anything in the air. Earlier this year, YouTuber Primal Space took the time to explain how such extraordinary imagery is captured, and the kind of equipment needed to nail it. While it’s certainly entertaining for regular folks to watch, the high-quality footage is also useful for space companies as it allows them to analyze their rockets in great detail during the launch sequence. You can check out Primal Space’s fascinating video here.